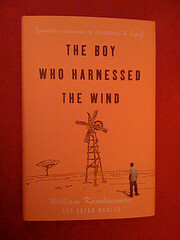 Yesterday, my friend Caroline and I went to a book launch event for The Boy Who Harnessed the Wind. She was invited to the event through her job, and asked me to come along with her. 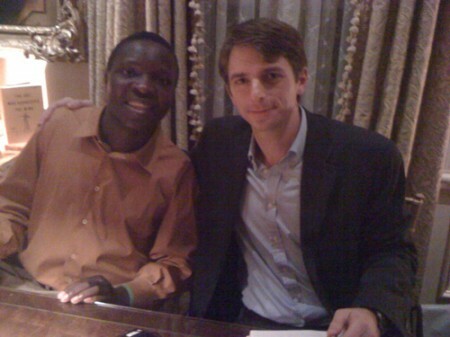 I had seen the author — and subject of the book — William Kamkwamba — on the Daily Show earlier in the week, and found his story inspiring, so I was very excited to get to meet him. William is from Malawi, and starting at a young age, he was fascinated with bicycle dynamos and radios. When a famine hit the country and his parents could no longer afford to send him to high school, he decided to try to continue his education by going to a small library with about 900 books. He didn’t read much English, but he was fascinated with the science books and learned mostly by looking at the diagrams. In one book, he saw a windmill and decided to build one to bring electricity to his home and his village. He shared how he collected scraps of metal and PVC pipe from a trash yard, and how his family and friends thought he was crazy. But his idea worked — he ultimately created a functioning windmill, built a circuit breaker and light switches, and stored the power the windmill generated in an old car battery. I took AP physics in high school and I’m pretty sure I couldn’t have done any of that. He and his co-author, journalist Bryan Mealer, shared a lot of stories about the tough times William’s village was having during the famine, and how he gathered together parts with the help of his cousin and another friend. He also then talked about what happened after journalists had discovered what he’d done. He was profiled in many papers and was invited to speak at the TED conference, where he met Tom Rielly who would turn his story into a documentary and help get him into a pan-African high school in South Africa. He’s now helping William pursue college in the U.S. — he’s been looking at Harvey Mudd while he’s been in LA. William also told some funny stories about his first time on a plane, in a hotel and using a computer — and how he wished he had access to Google back when he was trying to figure out how to build his first windmill. And we heard about the changes in the quality of life in William’s village — he built another windmill to pump water for his mother’s garden, and started a youth soccer team to keep other kids out of trouble. The village also now has its own fresh water source, and William’s parents’ home has a real roof and some better amenities than it had when he was growing up. I’m really excited to read the book, which I got signed by both William and Bryan. I’m very honored to have met them — and have had a bit of time to actually talk to them. I also met Ben Nabors, who is producing the documentary about William’s story. Check out the Moving Windmills short below to learn more. Wow, what a truly amazing and inspirational story. Makes you realize that all things are possible. Some of the best stories of human courage and strength come from places that aren’t “gifted” with the advances of modern society. Thanks for blogging about this, Francine. I’ll have to see if I can find the book!